Blush is an on-location bridal beauty service located just outside of Yosemite National Park. They specialize in destination weddings within the park and throughout Northern California. 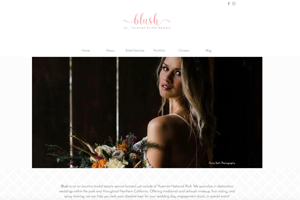 Offering traditional and airbrush makeup, hair styling, and spray tanning, Blush can help you look your absolute best for your wedding day, engagement shoot, or special event!